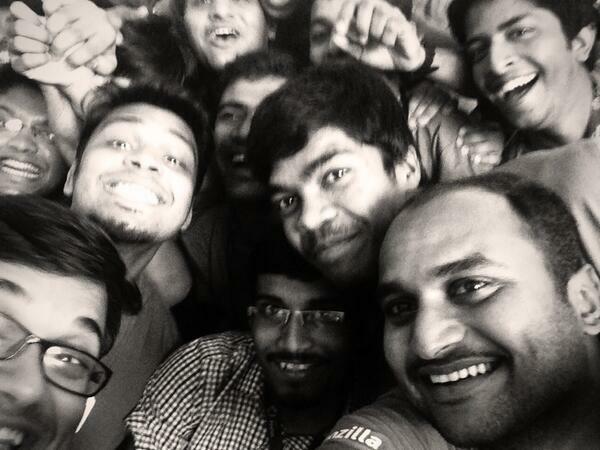 The Mozilla India Community Meetup ‘14 far surpassed my expectations. This is the first time a large number of contributors joined the community meet-up in India and it was collaborative, fun, productive all at once. The Mozilla India Community Meetup is an invitation-only gathering of some of the most active contributors in the Mozilla India community. There were brainstorming/swarming sessions, SWOT analysis, informative and productive breakout sessions, ten minute QUILT updates from the Task Force Teams, Australis update, a user research of FirefoxOS in India and spicy food throughout. I am lucky to be a part of the organizing team, due to my involvement with Mozilla. There were a total of 65 community members at the event: staff, hackers, localizers, events, marketing, testers, support, womoz, FSA's and the users. I traveled all night from Bangalore, with severe flu and cold to Hyderabad (took severe drugs to stay alive for the weekend though) and arrived on Friday morning just in time to join the Task Force Teams meeting. I spent the better part of the day working on events sop/process with my partner in crime, Vineel. We did brain swarming than storming to list all the challenges and how to proceed further with the community increasing and put up our ideas with the team and got valuable feedback from different task forces. All the task force teams (L10n, Technical, Support, Webmaker, ReMo, Engagement) gave a 10 minute update on their accomplishments from Jan 2013 till April 2014. In the second half of the day was the time to build goals on what the teams would like to achieve in 2014. The rest of the attendees for the main meet-up started arriving from evening and we all went out for a long dinner, where we had a chance to get to know each other. What are you most proud of in 2013? What was your biggest challenge in 2013? What is your big goal for 2014? I spent the better part of the afternoon brainstorming ReMo program with Brian & Vineel. Gen gave a talk on the Australis launch (how, what, where, when, community involvement) that is going to be released with Firefox 29 this month on April 29. The day was rounded off with discussion on ReMo program with all the community. Quality over quantity is one of the key things that were discussed. Mentors to be limited to have ~10 mentees, so there is a good mentor-mentee relationship between them. and then the sumptuous dinner with desi music (thanks to DJ Tripad ). The last day of the meet-up was a bit more laid back, we talked about the new Task Forces. I joined with Webmaker, FSA, Design and Technical teams on how we can get the users engaged with the community (be it with online events, offline events, mozillaindia.org, social media et cetera). Just before the lunch was the time for group pictures! and then was the time for all selfies and different team pictures! 2. What do you think we showcase? 3. How do we promote? Technical Task Force managed to rip off the Reps events page into mozillaindia.org just in few hours and plan to embed Webmaker & FSA events as well. More exciting things to go live on the website pretty soon. We enjoyed a delicious dinner, send-off for a few Mozillians and a corrupted video download by Deb at the hotel before calling it a night. Everyone started leaving one by one and a couple of us had a late evening journey. So, it was a Hyderabad tour time in 40C heat! The Community India Meet-up was truly an amazing experience for me. I met so many people from the community for the first time. I am happy, excited and invigorated with the meet-up! Thanks everyone who could join us at the meet-up online & offline . Now I’m back to Bangalore. Lel.